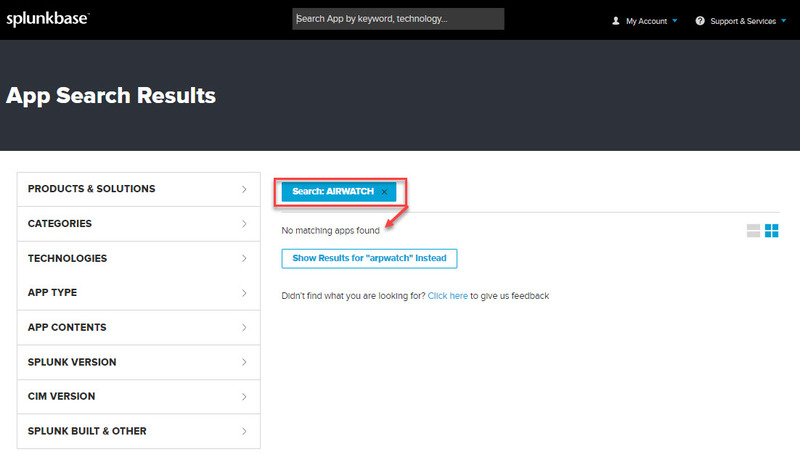 Have you ever searched for a Splunk app or TA and came up empty? We have too... Not to worry though, with a little parsing and some dashboarding we should be able to create visibility where there may not be much previously. This was exactly the case when we tried to parse AirWatch logs (https://www.air-watch.com/). Figure 1: At the time of writing this article, no app or TA existed for airwatch. If you have this same situation, hopefully we can help you too. This is the process we followed along with the regex used and the final dashboard produced. As a bonus, not only will we give you our regex that we used, but also the dashboard code at the end of the article. You should not need to restart Splunk, but give it 5 minutes and search with your index and sourcetype again in Verbose mode and the fields should now be parsed. Even though we did not have a Splunk TA or App to help create visibility, we did this ourselves using the flexibility provided within Splunk. We hope this article helped other save time. If it helped or even if it did not work, feel free to leave a comment below. Happy Splunking! Welcome to Part two in our series on Monitoring USB Storage Activity. In the first article (http://www.securitysynapse.com/2018/11/monitoring-usb-storage-activity-part-1.html), we examined what is required to monitor USB Storage connect and disconnect events. But how about activity that happens after the drives are connected? The good news is that this is also possible using Microsoft Windows Event logs and a bit of data crunching effort. 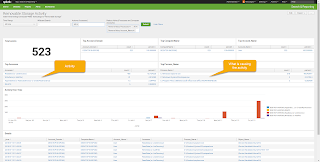 In this article we will again use Splunk to aggregate, process, and display the logs. As a bonus, we will not only outline the steps to accomplish this task, but we will also provide working dashboard code at the end of the article. There are two main steps needed to accomplish this task. 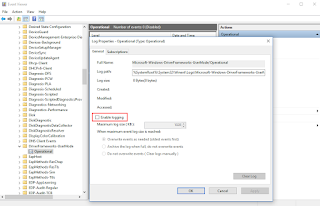 We need to generate and collect the Windows event logs and then we need to process and display the logs within Splunk. Each is outlined below. Double click and audit for Success and Failure. After enabling auditing, we rebooted for good measure, because hey, this is Windows. 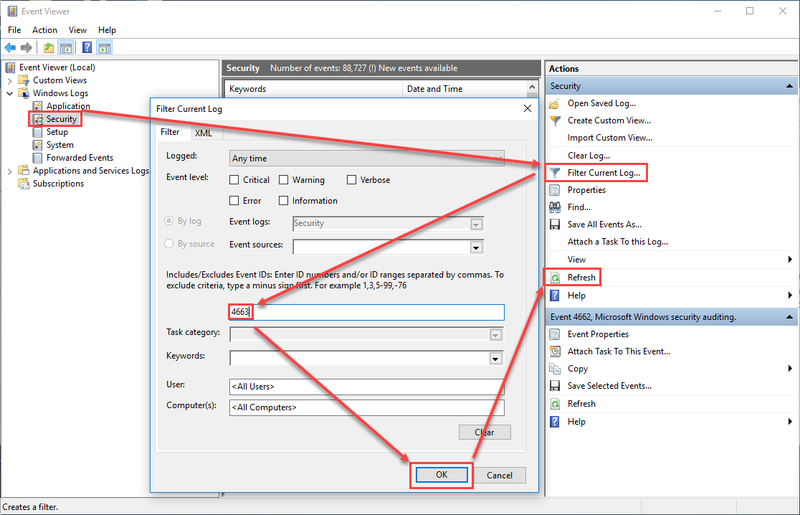 Now that Audit Removable Storage is enabled, open Event Viewer > Windows Logs > Security. Select Filter Current Log on the right-hand side and type in 4663 for event ID and click OK. Insert a USB device and click the Refresh button on the right-hand side. If all is well, there should be multiple 4663 success events. Note that Event ID 4656 is used for failures. Message=An attempt was made to access an object. Now that the logs are being generated, they need to be forwarded from the endpoints to a central location—in this case Splunk. 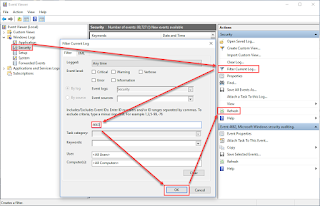 This task could be accomplished using a number of methods such as Windows Event Collector (WEC), a Splunk Universal Forwarder agent, or some other forwarding method. For this demo, we will use a Splunk Universal Forwarder shown in next section. 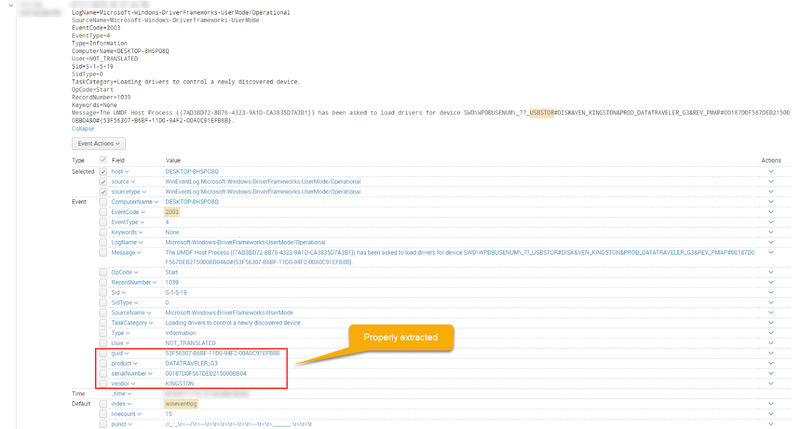 While we are assuming a functional Splunk Enterprise installation exists, we still need to collect the logs. 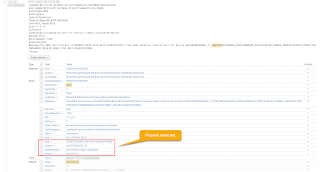 We provide a sample Splunk Universal Forwarder configuration file below to help those using the Splunk Universal Forwarder. Note: we will be placing the events into an index called wineventlog. If this index does not already exist, you will first need to create it. Now that we have the proper event IDs flowing into Splunk, we created a Removable Storage Activity dashboard. The dashboard provides statistical analysis for top accounts, hostname, actions, and processes. It even includes events over time by hostname and action along with the details needed to investigate USB connections. Because there may be applications within an environment that scan or interact with removable storage, it may be necessary to add some filters to reduce noise which can be customized for each environment. For your convenience, we included the dashboard code below. Have you ever wanted to monitor what goes on with removable media in your environment, but maybe lack the money or man power to run a Data Loss Prevention (DLP) tool to monitor the USB devices? The good news is that you can do this on the cheap using Microsoft Windows Event logs and a bit of data crunching effort. In this article we will provide a few ways to collect the logs, but we will ultimately use Splunk to aggregate, process, and display the information. As a bonus, we will not only outline the steps to accomplish this task, but we will also provide working dashboard code at the end of the article. Unfortunately, this log is disabled by default. 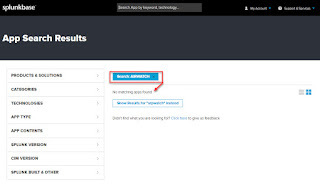 Administrators can manually enable it per machine or take action on a larger scale using a login script or other mechanism outlined in the References section below. 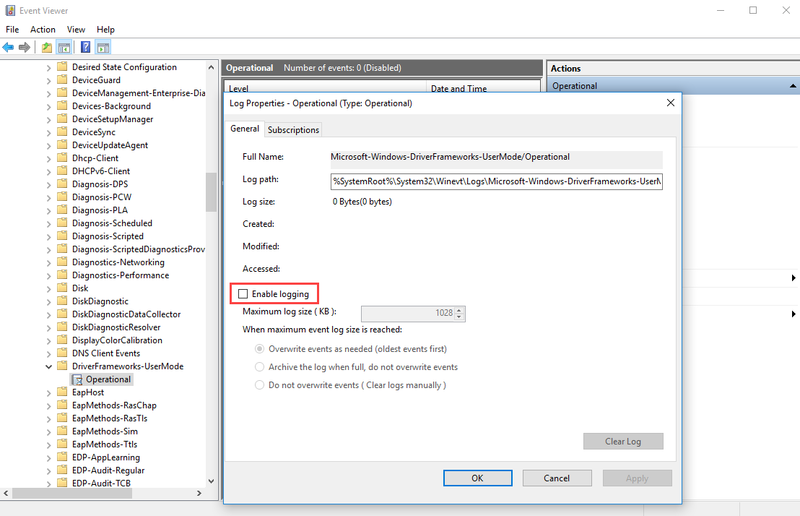 For this article, we will enable the logs manually by right clicking on “Operational” and selecting “Properties” to show that it is disabled. Check the box to enable these logs. After checking the box, we rebooted for good measure, because hey, this is Windows. Fortunately, there are far fewer event IDs associated with disconnecting a USB device. Feel free to explore the data within each event but note that we have called out two Event IDs that contain the most amount of data pertaining to connection (2003) and disconnection (2102). Now that we have the proper event IDs flowing into Splunk and the necessary fields extracted, we created a Removable Storage Connections dashboard. The dashboard provides statistical analysis for connects, disconnects, top vendors, products, serial numbers, and hosts. It even includes events over time by action and serial number along with the details needed to investigate USB connections. For your convenience, we included the dashboard code below.